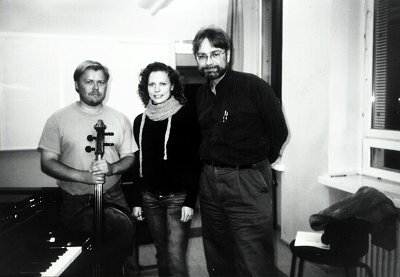 Pensola and Ruottinen are experts on the art of Western Classical The premiere composition by Eero will be played by two very well known Finnish virtuoso musicians, Minna Pensola, violin, and Roi Ruottinen, cello, with Eero on the harmonium. The Indian representation will be by A. Durgaprasad and R Ramesh. Eero Hämeenniemi, has collaborated with a number of Indian artists in the past, including: Karaikudi R. Mani, K.S. Subramanian, Daksha Sheth, Mahesh Dattani, Shobana Jeyasingh and Mallika Sarabhai. eRRe is an ensemble joining together Carnatic and Western musicians. ”Mylapore Variations” explores the ways different variation techniques are used in the two traditions. This includes both predetermined (theme and variations, sangatis) and improvised variations. 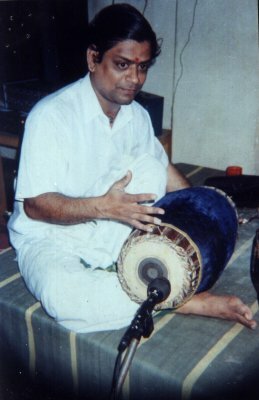 R Ramesh (mridangist) has trained under maestro Sri Karaikudi R Mani and won several awards for his expertise in percussion with the mridangam. He has accompanied leading Carnatic musicians including Padmasri Lalgudi Jayaraman, Shri Maharajapuram Santhanam and Sri T N Seshagopalan, among others. He has travelled widely on concert tours. He is currently with All India Radio, Chennai. 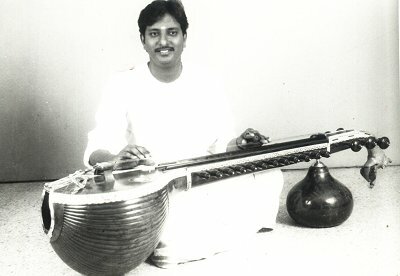 Durga Prasad (gottuvadyam) has trained under his father, gottuvadyam vidwan Sri Allam Koteswara Rao as well as under late Guru Kalasikhamani Sri A Narayana Iyer. According to ancient classification of stringed instruments, gottuvadyam is classified under the veena group of musical instruments.While the veena is fretted, the gottuvadyam is unfretted. An orthodox musician with a rare rhythmic balance and tonal purity in his performances, Durga Prasad has performed around the globe at various music festivals and won appreciation from listeners and critics alike. He is currently with All India Radio, Chennai. The Park’s THE OTHER FESTIVAL is proud to bring the world premiere of “Mylapore Variations”. Your work has grown through the stages of ‘Modernist to Neo- Expressionist in the 1980s to tradition conscious’ (according to a write-up on the net). How did you evolve through these styles? Is this really important? I am not sure I would characterize my work as Neo-Expressionist in the first place. This is just useless Western musicological jargon. I concentrate on trying to put on paper what I have in my mind and what has developed through my contact with, for example, India. I am not in the business of self-analysis and explanation that so many artists make themselves busy doing. You have composed for symphonies, jazz, ballets, dance and even chamber music. How do you approach these varied music genres? I just finished my IVth Symphony. In such a work, unity is the main consideration. I wrote a half-hour piece for 104 musicians on a single theme. There a composer must try to be imaginative, so that the material will not always return in the same form, but presents at each re-statement, new and interesting facets of itself. For jazz and chamber music, the main consideration is the role of the individual musician, as these are forms, where interaction between the players is very important. Music for dance tends to emphasize the element of rhythm, as dancers need something to hang on to. Since 1990s, the blending of Indian elements has become an integral and inseparable part of your music. What interested you in Indian rhythms? I was interested in Karnatic rhythms, because of the very important structural role they play in Karnatic music. In the West, rhythm is mainly a way for creating movement, but in Karnatic music, it can also create structural tension and release as well as a sense of arrival. We western musicians normally use harmony to achieve these ends. You are one of the first Finnish composers to take a serious interest in dance, western as well as Indian. Has your frequent visits to India prompted this interest? I was interested in dance even before coming to India, but Bharatanatyam is such a beautiful and musically challenging dance form that my contact with India made my interest in dance stronger than ever. Much of the fusion music available sounds so repetitive, and is even being marketed as “lounge music”. Your comment. In every genre there is the good and the bad. There is also excellent fusion such as Shakti-ensemble, for example. Is your appearance at The Park’s THE OTHER FESTIVAL, your first performance in India? How do you feel about it? I have performed in India many times. I would especially like to mention the numerous appearances with Guru Karaikkudi R. Mani that I have so enjoyed. I am very pleased to come to The Other Festival, because I have attended the festival nearly every time, and I know what a lovely and important event it is. Was “Mylapore Variations” specially composed for The Other Festival? A few words on the world premiere of this work. Yes, it was composed specifically for this festival in appreciation of the ground-breaking work you are doing. I am very interested in trying to write music where both western and Indian musicians can use all their skills to the full. I hope this is such a work.